(Press release from Siam Park) A day full of adventure and fun at the new Siam Park is possible in the winter as well as the summer. Loro Parque group keeps working for the improvement of its parks quality and the comfort of their visitors launching Siam Park´s water heating system. At 24 º Celsius visitors will enjoy the newly open attractions despite low temperatures, enjoying sunbathing at Siam’s white sand beach and taking pleasure in a tasty meal contemplating the wonderful views of the Wave Palace. Water is heated by the only natural gas plant of the island which keeps the water warm and reaches the company’s genuine concern for the protection the environment. 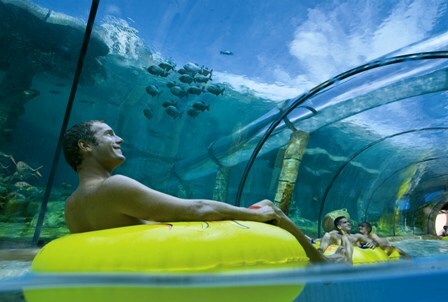 Siam Park shows care for the comfort of the whole family in its exclusive adventurous attractions. Its sunny beach, with exotic views of the wave palace and La Gomera Island, the relaxing sensations to be found in the waters of the lazy river also benefit from the 24 º temperatures that provide a warm feeling to all visitors. Water through out the park is constantly renewed to ensure its purity, as well as the health of the swimmers, making them feel just like fish in the water. Once out of the water, swimmers may indulge themselves by relaxing into the expert hands of Siam Park masseuses (at the floating market). A great chance to enjoy the sun and pleasant temperatures of south Tenerife, surrounded by beauty and adventure, that will make a day at the park one of the most special days of the year.